Edutopia blogger Todd Finley praises Edward de Bono's PMI model and demonstrates its uses as a student-friendly springboard to the critical thinking process. Edward Charles Francis Publius de Bono is a bona fide genius. The author, inventor, Rhodes scholar and Nobel prize-nominated economist graduated from college at age 15. In the field of education and business, he is famous for originating the term lateral thinking. In his spare time, he also wrote Six Thinking Hats and several other books on creativity. Of all his contributions to the field of education, there is one critical thinking method that I use in classes more than any other: the PMI, a brainstorming model built on the categories of plus, minus and interesting. When you ask a volunteer from your AP English class to analyze the Gettysburg Address, not one hand raises. You post an anonymous 10th grade argumentative essay on the document camera for your students to critique, but the same three volunteers who always answer are the only kids with comments to contribute. You want to prime your 7th grade social studies students to look more deeply at the pros and cons of gun control legislation. You can't think of a good pre- or post-reading exercise to tell your substitute teacher to use. Handier than a Blendtec Countertop appliance, the PMI writing/thinking protocol is intellectually useful in dozens of contexts. Because it has never failed me, I want you test out the PMI this week, unequivocally confident that de Bono's strategy will enhance critical appraisal of any subject. A side note: writing is thinking; try typing a sentence without thinking -- it doesn't work. For two minutes in the plus column, write (with laser-beam focus) about all of the possible positive things regarding a subject or about taking an action. For two minutes in the minus column, write (with the focus of a begging Labrador) about all the possible negative things related to a subject, or about the negative effects of taking an action. For two minutes in the interesting column, write (with the focus of a pre-tenure NYU professor) about all the interesting things related to the subject, or implications and possible outcomes of taking an action, whether positive, negative or uncertain. As I mentioned before, the PMI is useful in almost any process-oriented classroom context. It is particularly powerful for analyzing case studies and prewriting. 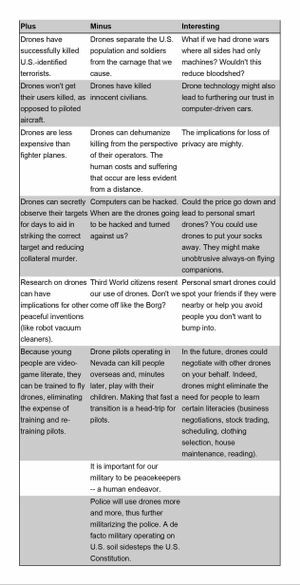 To illustrate the later, let us imagine that my 1982 high school English teacher, Mrs. Beverly Forslof, tracks me down and asks me to write a "think piece" on the topic of drones. Furthermore, she directs me to demonstrate critical and creative thinking in fewer than 500 words. I don't know much about predator drones, except that the U.S. military uses them extensively and that they are terrifying. Putting aside my ignorance, I set my timer for three two-minute intervals and develop the following PMI. Whew! That was intense! The six minutes that I spent working through the PMI protocol helped me arrive at a topic that I am passionate about exploring: not the drones as weapon aspect of the technology, but drones as precursors of technologies that empower individuals. My prewriting has excited my imagination; technology might herald the dawn of private smart robots, personal flying companions that solve problems for us and negotiate with other robots on our behalf -- a scenario envisioned by speculative fiction author David Marusek in Counting Heads. If we assigned basic literacies to robots, what literacies would then become critical for humans to master? That's a topic I've never really thought about before. Thank you, PMI! In six minutes, I surveyed possibilities and came up with an action plan, effectively jump-starting my imaginary essay. The PMI has never failed to generate an "aha" idea for me. 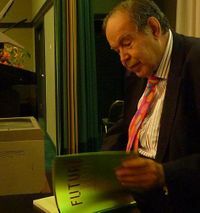 Edward de Bono came up with numerous other critical thinking activities that help students solve problems. Try out his To Lo Po So Go strategy. That link also includes numerous sponge and transition questions to nourish kids' creative intelligence. David Koutsoukis has compiled 50 more of these questions, with answers included.